It’s probably been at least 20 years since I looked at, or even thought about, the Muppet Movies, and today I stumbled across The Great Muppet Caper on cable and decided to watch for five minutes. I was hooked, laughing more than I do at most comedies, and found myself blown away by the creativity, production value (complete with Busby Berkly style production numbers) and hip, double entendre laden charm. What a hoot! I think a lot of the charm has to do with how the muppets — handpuppets here, no CGI, thank you — interact seamlessly with humans who accept them as a normal part of the landscape. And the writing — really, truly funny, clever in that way that lets kids get what they need, but provides adults with another level of humor that doesn’t get in the way of the kiddy fun. 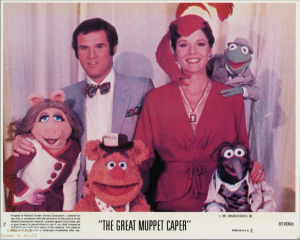 In The Muppet Movie, she has just won such a contest (Miss Bogen County) when she first meets Kermit and joins the Muppets. In The Great Muppet Caper Piggy proves she has a talent for tap dancing, seemingly without knowing it. She and Kermit also kiss (on the lips, yet slightly covered) while Miss Piggy is a prisoner in jail; Miss Piggy ends up wearing Kermit’s fake mustache, while Kermit has X-marks on his upper lip. Eventually in the films, Kermit started returning her affections and (unwittingly) marries her in The Muppets Take Manhattan, though subsequent events suggest that it was only their characters in the movie that married, and that their relationship is really the same as ever. In 1987, Miss Piggy was a guest star on Dolly Parton‘s musical variety show, Dolly, singing and performing with Parton, while at the same time secretly attempting to steal the show from her host, mostly by sabotaging Parton’s musical segments and attempting to trick producers into giving her more solo spots. Parton, annoyed at being undermined by Miss Piggy, told another of her guests, Juice Newton, that they might be “having ham sandwiches after the show”. Miss Piggy starred in the TV movie The Muppets’ Wizard of Oz, appearing as all four witches. Miss Piggy has a pet poodle, Foo-Foo. Miss Piggy sang with the Jonas Brothers as “Joan S. Jonas”, with Ashley Tisdale during the number “Bop to the Top” dressed as Sharpay from High School Musical, and with the Cheetah Girlsperforming “Dance Me If You Can” from The Cheetah Girls: One World as a part of Studio DC: Almost Live. A running gag from those first two episodes involved Miss Piggy looking for “Zacky” Efron. In The Muppet Show episode 106, Piggy is referred to by the full name “Piggy Lee”, and in episode 116 Piggy tells guest star Avery Schreiber that Piggy is short for “Pigathius”, which is “from the Greek, meaning ‘river of passion'”. However, there is no evidence to support that this is part of her name. It is more likely that this is a fictitious name Miss Piggy invents as part of her plan to make Kermit jealous. In another instance, Piggy explains that her first name is actually the more feminine-sounding version of Pigathius, “Pigathia”. There are enough funny quotes from this one movie to keep you smiling for awhile — here are some of the best, courtesy of IMDB. Miss Piggy: [to Nicky] You! It was you! Kermit was right! You’re a phony. You’re a phony! Yes, you are! And you know what, you can’t even sing! Your voice was dubbed! Lady Holiday: It’s plot exposition. It has to go somewhere. Kermit: We’re going to catch those crooks red-handed. Dr. Bunsen Honeydew: I suggest we jump. Fozzie: Are you crazy? That’s at least a hundred feet! Dr. Bunsen Honeydew: I didn’t say it was a *good* suggestion. Beauregard: Maybe we could jump part-way. Beauregard: Takes awhile to get to know the town. Fozzie: How long have you lived in London? Kermit: How come you don’t have an English accent? Beauregard: Hey, I’m lucky to have a driver’s license! Pops: Hey, how’re you guys fixin’ to pay? News Editor: Why? What happened? Gonzo: I don’t know. I just always wanted to say that. Fozzie: What does “BSC” stand for? Kermit: I hate to be rude, but we’re trying to do a movie here. Miss Piggy: What am I? A glutton for punishment? Kermit: We were wondering if you could recommend a nice hotel. Actually, a cheap hotel. British Gentleman: Well, that narrows the field a bit. Kermit: Happiness Hotel? That sounds great. Gonzo: What’s wrong with bus terminals? Fozzie: Uh, excuse me, Mr. Holiday, sir. Would you let Kermit go? If you hold him too long, he’ll just give you warts. Miss Piggy: [about Dr. Teeth and the Electric Mayhem’s playing] They don’t have to play this loud. Kermit: That’s okay, they don’t mind. Fozzie: Kermit, can you reach the hostess call button? I’m hungry. Kermit: They don’t serve food in 9th class. Fozzie: What? Twelve dollars and we don’t even get a meal? Sam the Eagle: You are all – WEIRDOS. Gonzo: I’d like to try this without a balloon. Kermit: I suppose you could try it once. Miss Piggy: Lawyer? I don’t have a lawyer. Miss Piggy: [short intake of breath] Kermie. Oh. No wonder he hasn’t come by to see me. He had to finish law school. Kermit: What’s wrong with the drummer? He looks a little crazed. Zoot: Oh, he’s just upset about missing the Rembrandt exhibit at the National Gallery. Pops: [to Kermit and friends who want to get on the bus] You’ll have to sit in the front seat, the back’s been quarantined. British Gentleman: For once the forecast was right. It said it was going to rain cats and dogs. Kermit: No, no. We’re bears and frogs. Fozzie: [sighs] It was nice of the Chronicle to pay for our flight home. Pops: Yeah, but a man should be treated better than his luggage. Scooter: Yeah, well, my luggage was sucked out the door. Luckily my radio is frozen to my wrist. Janice: “Look, Mother. It’s my life. OK. So if I want to live on a beach and walk around naked… Oh. Delivery Man: Mr. Holiday, did you order a gross of flowered socks? Lady Holiday: Give Stanley a tip, Nicky. Nicky Holiday: For complimenting you on your necklace? Lady Holiday: No, because it’s customary. Nicky Holiday: I haven’t any change. Lady Holiday: Then give him something bigger. Nicky Holiday: *Bigger*? I left my wallet at home. Lady Holiday: You left your wallet in college. Lady Holiday: Carla, the neckline on that gown is too high, don’t you think? Carla: I rather like the effect. Lady Holiday: You like looking like an ostrich? Carla: [miffed] Of course not, Lady Holiday. Lady Holiday: And Marla. Too many frills and furbelows, I don’t think we should strive for the fan-tailed pigeon look, do you? And you, Darla, that outfit’s the pits. Loose where it should be tight and tight where it should be loose, like the folds on a turkey’s neck. Why would I design such atrocious looking clothes? Lady Holiday: I *must* be getting senile. Voice over intercom: Yes, Lady Holiday? Miss Piggy: My name is Miss Piggy, and I would like to be a high-fashion model! Lady Holiday: Doesn’t surprise me. Seems to be the way we’re headed. Miss Piggy: Oh, Kermy! Oh, I’ve missed you so! Kermit: [stiffly] Please, the name is Rosenthal. Kermit: I’m your attorney, that’s the only way they’d let me in here. Miss Piggy: Oh, right! Oh, I’ve missed you so… Rosenthal. It’s been an eternity. Kermit: [puzzled] It’s been forty-five minutes. Miss Piggy: Time goes slow in the cooler. Rowlf: Let me talk to them. Woof woof. Woof woof. Rowlf: It helps to know a second language. Fozzie: Kermit, are bears allowed in those fountains? Fozzie: Are bears allowed in those fountains? Kermit: No, I don’t think so. Fozzie: I need a bath. Gonzo: Gee, a lot of people worked on this movie! Kermit: Oh, this is nothing. Wait ’til you see the end credits. Fozzie: Nobody really reads those. Do they? Kermit: Sure they do. They all have families. Prison Guard: TWO MINUTES PIG! Gonzo: [after taking pictures of pigeons outside] Local poultry. Pops: [banging on bathroom door] Hey! What’s goin’ on in there? Lotta folks out here need to use the restroom! Kermit: Well, we’re developing these pictures, we’ll be out as soon as we finish. We’re trying to catch a jewel thief. Pops: Well, catch him in another room, people are dancing up and down on one leg out here! Fozzie: [going over check list] Wax lips? Zoot: [checking his pockets] Man, I just had them! Dr. Teeth: Did ya leave ’em in your other pants? Zoot: I don’t have no other pants! Fozzie: [going over checklist] Whoopie cushion? Rowlf: I think it’s on the bus. Kermit: How are we supposed to cut through the bars if nobody brought stuff to cut with? Floyd: I brought some hot mustard, maybe that will eat through the bars. Kermit: [on the plane] Someone’s coming. Fozzie: Oh, maybe they’re bringing hamburgers. News Editor: Did you read these headlines? Huh? News Editor: “JEWEL HEIST ON MAIN STREET!” And it’s nice bold print, isn’t it? Kermit: Yes, it’s very easy to read. News Editor: Shut up now. News Editor: here’s our cute little banner story, “Identical Twins Join The Chronicle Staff.” Now I ask you, which would you buy? Fozzie: I read the one that has “Dear Abby.”. Fozzie: [pleading] We’ll do better next time. News Editor: Next time? Next time! News Editor: What makes you think there’s gonna be a next time? Kermit: Well, if there isn’t it’s gonna be a real short movie. Kermit: [on the plane to England] I think I’ll read for a while. Kermit: Uh, I wish I had a book. Gonzo: [going over the Thames] What’s the name of this river? Fozzie: I believe it is the English river. Fozzie: [Gonzo takes a picture on the bus] Oh did I get my elbow in the shot? Gonzo: Don’t worry it adds human interest. Fozzie: But I’m a bear. Kermit: [standing outside the Mallory Gallery] How do we get in? Fozzie: I suggest we ring the door bell. Fozzie: I sure could use something from one or more of the basic food groups. Gonzo: [looking at the models] Hubba hubba! Miss Piggy: Adios, mon cherie. Nicky Holiday: [Lady Holiday’s necklace has just been stolen] What do you want me to do? I just spilled ketchup all over my cummerbund. Dorcas: What would you buy if you were bored? Neville: Uh… a jar of calf’s foot jelly. Miss Piggy: [at the supper club] Well, what a delightful menu! Kermit: [nervously] Oh, hah, nothing, it’s just sort of amusing that the roast beef is the same price as an Oldsmobile. Kermit: [the Muppets are in a frenzy about Kermit’s date] Fozzie, this is all very embarrassing! Fozzie: Don’t worry Kermit, it won’t leave this room. 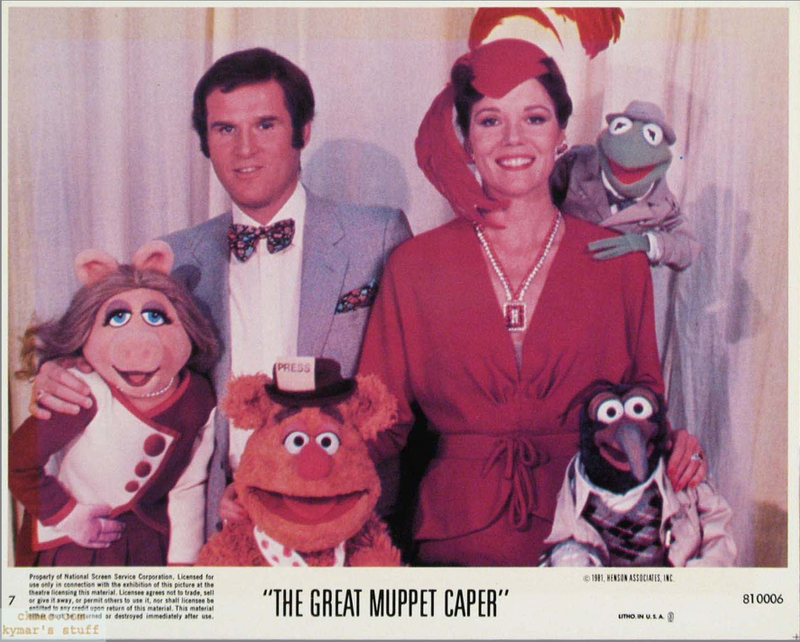 The Muppet Newsman: Here is a muppet newsflash! Kermit the frog to date Lady Holiday! Details at 11. Fozzie: Hey, Kermit, I’m getting hungry. Rizzo the Rat: That’s OK, there’s no food, either. Kermit: [he, Fozzie, and Gonzo are stuck in the bed, which has closed into the wall; he talks muffled] Could somebody turn out the light? Kermit: But… Nicky, why are you doing this? Nicky Holiday: Why am I doing this? Because I’m a villain. It’s pure and simple. Kermit: Piggy? Piggy, you’re overacting. Kermit: You’re overacting. You’re hamming it up! Miss Piggy: I am not! I am trying to save this movie. Kermit: Yeah, well save your performance instead! Miss Piggy: Well, as you can see from this small sampling, modeling is my life. It is my destiny, I shall accept nothing less. Lady Holiday: I can offer you a job as a receptionist. Miss Piggy: [jumping up and down and shouting] AAAAAAAHHHHH! I’ll take it! I’ll take it! Oh, thank you! Thank you! Thank you! Oh! Oh! Oh! Oh, you won’t be sorry, I promise. I can type, I can take shorthand, I can make coffee, I can do it all! Miss Piggy: I can sit. I’m very good at sitting. Sam the Eagle: It’s times like these, I’m proud to be an American. Gonzo: Wait a minute! Hold it right there. Don’t go home yet. Gonzo: I’ll send you each a copy. Pops: [awakes from his nap abruptly] What? Kermit: We’d like a room. Kermit: Yeah, we’d like to check in. Happiness Hotel Guests: [emerging from their rooms] SOMEBODY’S CHECKING IN? Pops: [after Beauregard crashes his cab into the Happiness Hotel] You can never find a cab when you need one. Fozzie: [drinking champagne] You know, if you put enough sugar in this stuff, it tastes just like ginger ale. Lady Holiday: Nicky, that’s my new secretary dancing out there. Zoot: Aw man, I just had ’em. Dr. Teeth: Did you leave ’em in your other pants. Zoot: I don’t have no other pants. Fozzie: [in hot air balloon] What if there’s a storm? Or we get hit by lightning? Kermit: Uh, don’t try it, Gonzo. We need you for this movie.